At the Schedule step of the wizard, select to manually run the SureBackup job or schedule the job at specific time, for example, after the corresponding backup job completes. To specify the job schedule, select the Run the job automatically check box. If this check box is not selected, you will have to manually start the job to perform recovery verification. Daily at to start the job at specific time every day, on week days or on specific days. Monthly at to start the job once a month on the specified day. When you configure the job schedule, keep in mind possible date and time changes (for example, related to daylight saving time transition). After this job to chain the job. Typically, a SureBackup job should run after the linked backup job completes. In this case, the SureBackup job will verify the VM backup created by the corresponding job. To create a chain of jobs, you must define the time schedule for the first job in the chain. For the rest of the jobs in the chain, at the Schedule step of the wizard, select the After this job option and choose the preceding job from the list. In some cases, the linked backup job may not complete until the SureBackup job starts. If Veeam Backup & Replication finds out that the linked job is still running, the SureBackup job will fail to start. To overcome this situation, select the If some linked backup jobs are still running, wait up to check box and specify the necessary time period in the field on the right. If the linked job is still running, Veeam Backup & Replication will wait for the defined period of time and check the linked job after this period elapses. 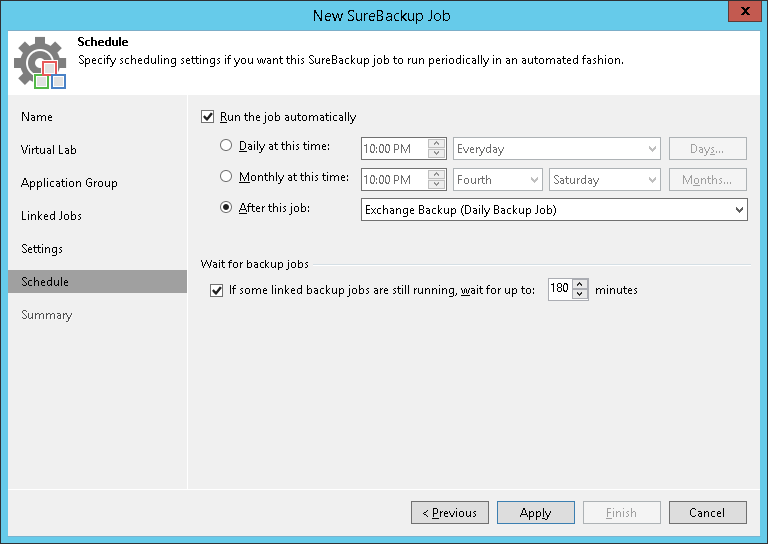 If the linked job is finished within the specified period, the SureBackup job will start. If the linked job is still running, the SureBackup job will not start. The After this job function will only start a job if the first job in the chain is started automatically by schedule. If the first job is started manually, jobs chained to it will not be started.